The next time you’re heading to a theater or sitting on the couch and you just aren’t sure which movie to watch, turn to Siri. Saying “Movie trailer for [movie]” can also work too. 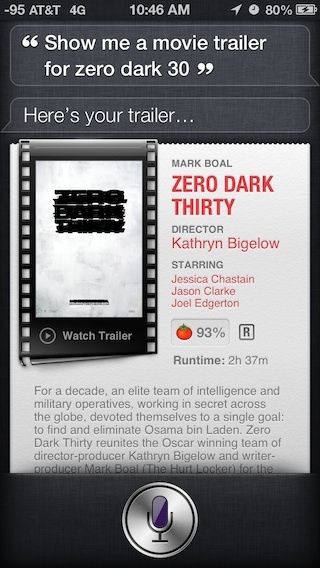 Siri will then briefly show an overview of the requested movie and then launch into the trailer for it rather quickly in landscape mode, so tilt your iPhone to watch it. This experience is best on LTE or wi-fi connections because the trailer quality will be shown as higher quality 720p video, whereas on the 3G/FauxG (or worse) connection you’ll wind up with 480p video or worse, which can look a bit pixelated. Even with a lower quality video though, it’s still watchable and can help you make a determination as to whether a movie is worth investing the time in or not. Going a step further, can use Siri to watch the trailer first, and if the flick is currently in theaters, you can then get local movie showtimes at nearby locations, and even buy tickets with Siri thanks to Fandango support. How great is that? Cinema fans will surely enjoy this one, I know I sure do. Oh, and you can check movie scores and ratings too, to get an idea of how good (or bad) a movie will be. Siri is really handy, eh?